Three-row crossovers continue to be one of the fastest growing segments of the automobile market and for parents who value roominess and extra seating in a compact body, the 2016 Dodge Durango scores massive points. Modern families want vehicles with sleek interiors that fit more than five passengers without coming in a big and bulky exterior package. When you are ready to experience a new kind of family vehicle, stop by Greenville Chrysler to test drive the 2016 Dodge Durango today. Our dealership proudly serves patrons from the Rockwall, Commerce, Bonham, Paris, Sulphur Springs, and Tyler areas with a team of customer service experts waiting to meet your car-buying needs. The 2016 Dodge comes with two engine versions: a base model 3.6-liter V6 engine that produces 290 horsepower and 260 pound-feet of torque, which is a solid number for a crossover SUV. The upgraded engine, available only in the highest level trim, includes a powerful 5.7-liter V8 option with 360 horsepower, 390 lb-ft of torque and an eight-speed automatic transmission. Both engines come with an option for a rear or all-wheel drive system and either version manages to produce a smooth ride with few bumps or issues when out on the road. Overall, the 2016 Dodge Durango offers a reliable and surprisingly strong performance that rivals anything in its segments and the SUV continues to be an excellent option for families searching for a crossover vehicle. Here is a quick glance a few performance specifications. The seven-passenger Durango comes in four trim levels: SXT, Limited, Citadel and R/T. The base model includes 18-inch alloy wheels, fog lamps, heated mirrors, fine cloth upholstery and keyless start among other things. Each model also includes the Uconnect touchscreen system which incorporates smartphone technology via Bluetooth® and hands-free connectivity that allows passengers to stream music, and use turn-by-turn navigation apps among other things. The highest level R/T trim adds in an upgraded suspension, performance steering, leather upholstery, a Beats speaker audio system and 20-inch wheels just to name a few things. All four versions of the 2016 Durango come equipped with wonderful amenities ready to meet the needs of every type of buyer. When you visit us at Greenville Chrysler, ask our wonder representatives for a full trim breakdown. 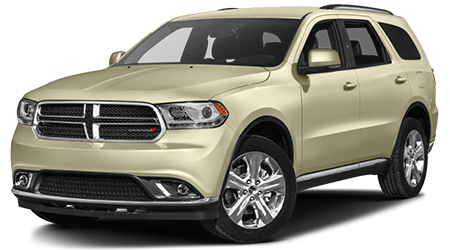 SUVs and crossovers are a crowded segment to compete in, yet for those buyers searching for something to stand out from the crowd, the 2016 Dodge Durango is the vehicle to discover. When you are ready for an SUV that values practicality, extra seating and space, visit us at Greenville Chrysler, where we serve buyers from Rockwall, Commerce, Bonham, Paris, Sulphur Springs, and Tyler with an expert team of customer service representatives ready to help make the car-buying process a breeze. We are located at 5401 Interstate Highway 30, TX 75402. Our Dodge representatives will be happy to get you driving off the lot in a new vehicle at the perfect price. We look forward to serving your today!